This morning we woke up to snow! It made for some beautiful views, and the mountains looked especially pretty with the dusting of snow. Sadly, this also meant unsafe conditions for flight, and so our first day in the field was delayed – i.e. cancelled. I’m glad that Helo Ops (helicopter operations) made that call as the wind and snow picked up later in the day. Not to worry – we find plenty to keep ourselves busy with, testing our lab equipment with DNA standards to make sure everything’s working properly and ready for samples as soon as we are able to collect and extract them. For our work into testing mechanisms of long-term cell survival, we are planning to do some sequencing in the field. 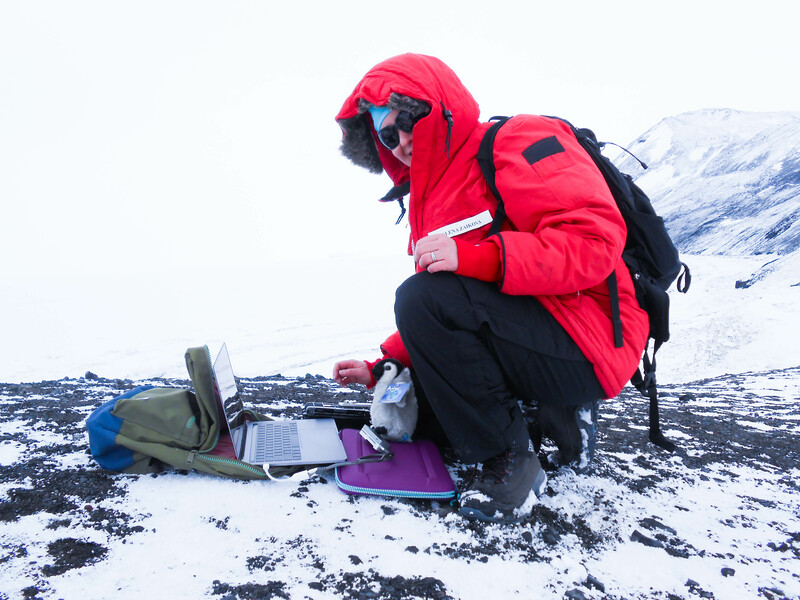 That’s right, sequencing out in the Dry Valleys in real time. The sequencer we’d use for this is Oxford Nanopore’s MinION that we are running offline with our laptop. 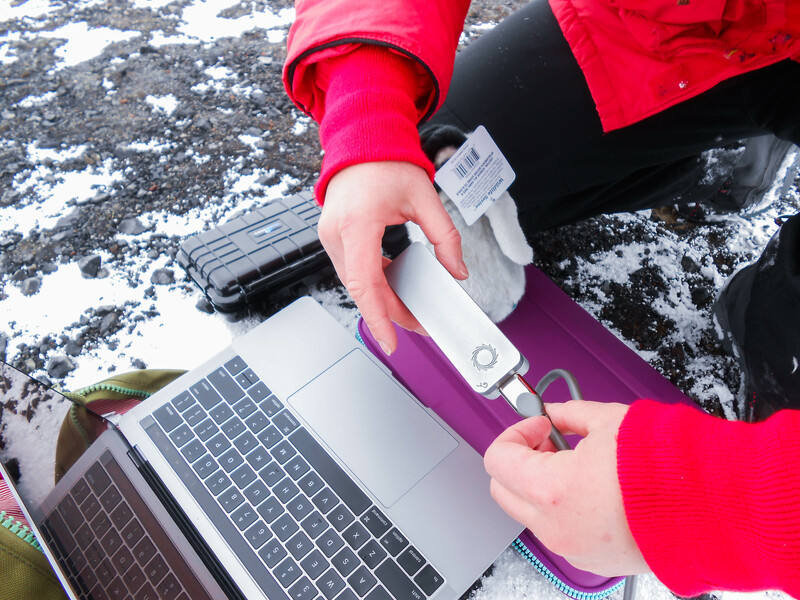 To make sure that the laptop and sequencer wouldn’t complain too much about the cold when we’re at our sample sites, we needed to verify the setup in the cold. What better day for this than today? Angela and I packed up the laptop and MinION (that we’ve yet to name) and hiked out to Hut Point. It doesn’t get better than combining science and recreation! Figure 1. 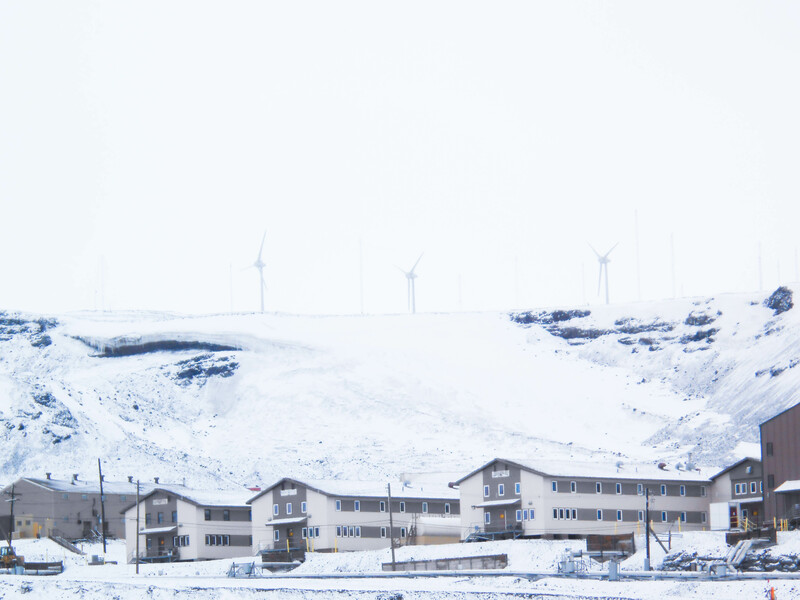 A misty view of our dorms and the energy powerhouses of McMurdo in the snow. Figure 2. Elena with Dasse the penguin, our lab manager. Hut Point is a narrow peninsula on Ross Island where McMurdo Station is located. Less than half a kilometer from the Station is the Discovery Hut built by Robert Falcon Scott in 1902 during the Discovery Expedition. The hut has been designated as a Historic Site, so we couldn’t go in, but it was great to see this amazing witness to exploration. 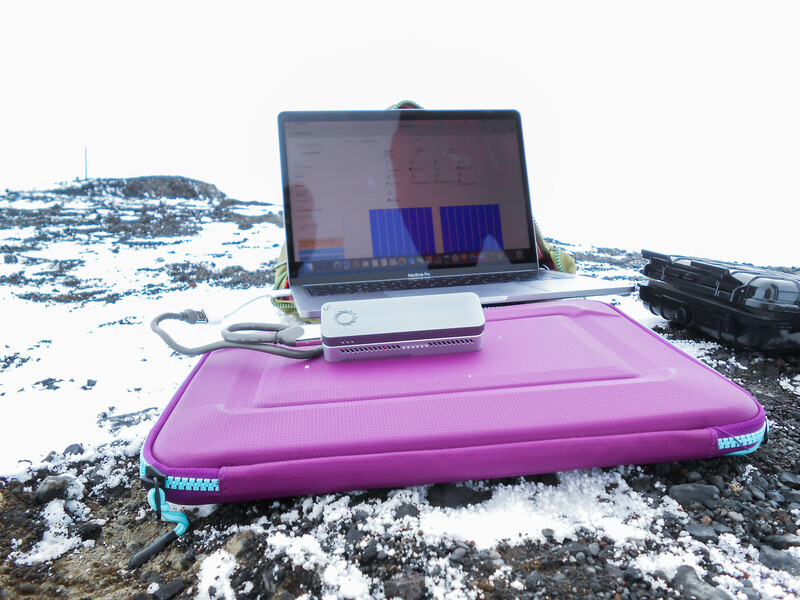 Once there, we marveled at the beauty around us, thanked our lucky stars, saw a Weddell seal, and then got down to business testing our sequencer setup. We connected the MinION to the laptop, launched the MinKNOW software, and ran a test using the configuration test cell. We were impressed at how quickly and smoothly it ran. We got a warning that it could not “ping”, but the software continued running as we were running it locally (not using the online server). The test completed successfully within a few minutes, so now we know it is doable in the extreme cold. Can’t wait to run some ancient microbial DNA on a Nanopore flow cell! This entry was posted in Antarctica 2016 and tagged antarctica on December 7, 2016 by Elena Zaikova.